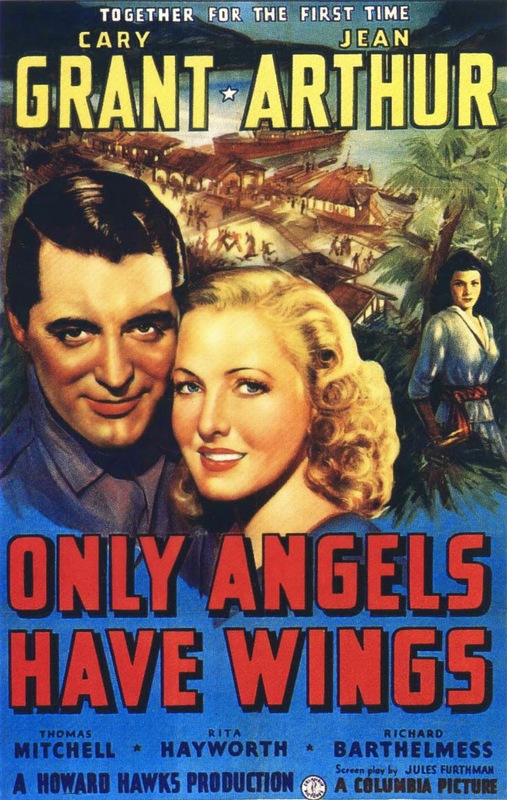 Cary Grant and company brave the turbulent skies in Only Angels Have Wings. The Stars: Cary Grant, Jean Arthur, Richard Barthelmess, Rita Hayworth and Thomas Mitchell. Source Material: An original story, Plane from Barranca, by Hawks. 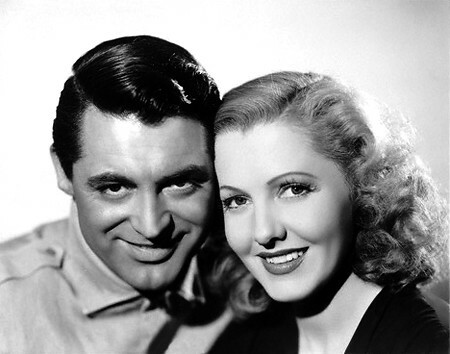 Cary Grant and Jean Arthur in a publicity still from Only Angels Have Wings. Awards: Nominated for two Academy Awards: Best black-and-white cinematography and best special effects. The Plot: Nightclub singer Bonnie Lee (Jean Arthur) falls in with a group of jungle pilots while her ship is stopped at a South American port. Bonnie falls in love with the group's leader, Geoff Carter (Cary Grant), but her love is tested when Geoff sends his pilots up in dangerous conditions so they can win a lucrative contract. Bonnie Lee (Jean Arthur) tosses off a tune in Only Angels Have Wings. Backstory: In the early 1930s, Hawks was in Mexico scouting locations for his film Viva Villa! (1934). Hawks worked with a group of jungle pilots to traverse the rural Mexican interior, and he never forgot that time. Years later, Hawks turned his experiences into the short story, Plane from Barranca, which was used as basis for Only Angels Have Wings. "I knew every character personally that was in that picture," Hawks later said. Cary Grant in a publicity still for Only Angels Have Wings. Best Performance: Thomas Mitchell as Kid Dabb. 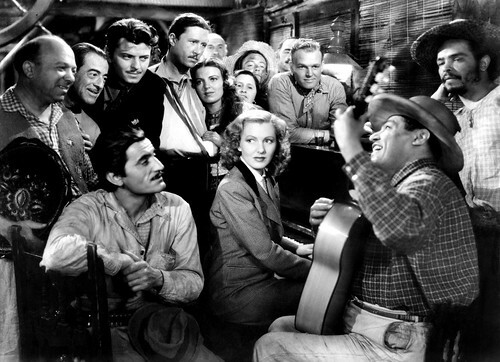 Mitchell won the Best Supporting Actor Oscar in 1939 for Stagecoach, but he could have just as easily been honored for Only Angels Have Wings. The legendary character actor steals every one of his scenes, including a memorable sequence where he tries to bluff his way through an eye exam so he can continue flying. In fact, Geoff and Kid's partnership is really the central relationship in the film rather than his on-again, off-again romance with Bonnie. Best scene: Geoff tries to talk down novice pilot Joe Souther (Noah Beery Jr) while he is attempting to land in heavy fog (clip below). Best Line: Calling Barranca, calling Barranca," a radio call from Tex (Donald Barry) to the pilots. Calling Barranca became a popular catchphrase in the forties, even appearing in Looney Tunes cartoons. Richard Barthelmess: Barthelmess, who plays guilt-ridden pilot Bat MacPherson, was a leading star in silent films, but his career had foundered since the beginning of the sound era. Hawks cast him in Only Angels Have Wings despite the fact that Barthelmess had visible scars from botched plastic surgery. Hawks felt the scars helped Barthelmess convincingly portray a pilot who had been injured in an airplane accident that killed his buddy. 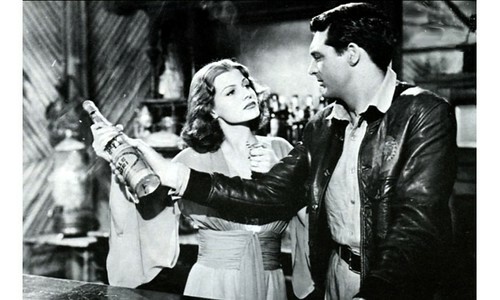 Judy MacPherson (Rita Hayworth) and Geoff Carter (Cary Grant) battle it out behind the bar in Only Angels Have Wings. Rita Hayworth: Hawks had several actresses in mind for the role of femme fatale Judy MacPherson, but Columbia chief Harry Cohn insisted that he hire Rita Hayworth, who was then a relative unknown. Hawks never took to Hayworth, and when the novice actress couldn't play a drunk scene, Hawks instructed Grant to pour a bucket of water over her head, so he could get some kind of reaction out of her. Despite Hawks cruel treatment, Only Angels Have Wings made Hayworth a star. Fun Fact: Celebrity impersonators always imitated Grant by saying the phrase, "Judy, Judy, Judy," although Grant never uttered those words on film. The closest he came was in Only Angels Have Wings, when he said "Judy, Judy" to Rita Hayworth. 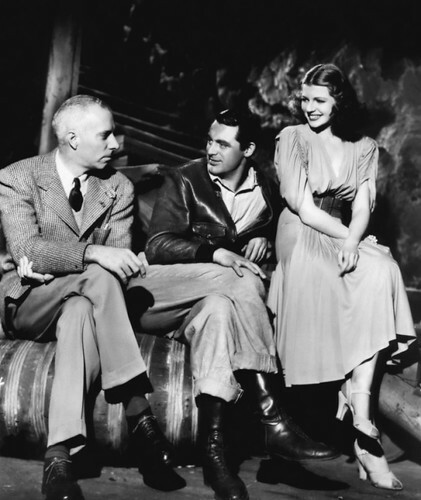 Director Howard Hawks and stars Cary Grant and Rita Hayworth on the set of Only Angels Have Wings. Why it's essential: There were many bush pilot films made in the late thirties and early forties (Test Pilot, Captains of the Clouds), but none were better than Only Angels Have Wings. The film is one of Hawks' best, a unique celebration of camaraderie and bravery among men who are facing death every day. Availability: Only Angels Have Wings is available for streaming on Flixster. It is also available on DVD and video on demand. Next week, we'll have a special President's Day edition of the essentials with Young Mr. Lincoln.